CM inaugurates Convention Hall at Mebo and assures to take all steps to address the issue of flood & Erosion. 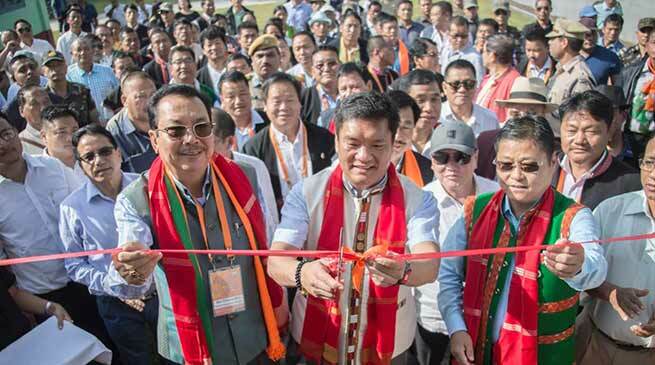 Chief Minister Pema Khandu inaugurated a Conference Hall constructed under SIDF at Mebo ADC Hq in the presence of Dy CM Chowna Mein, and others. The CM said such high quality works with optimum and judicious utilisation of the Fund should be emulated, while lauding the local MLA and team of Engineers of executing agency PWD. He appreciated the local MLA for his developmental initiatives, while also appreciating the good link road connectivity in his Constituency. Reiterating the importance of good network of surface, air and rail connectivity in the State for tapping the potentials in various sectors and boosting economic activities of the frontier State , he said that foothill belt of the state can lead the future of Arunachal economy towards the path of prosperity. The Central Government under PM, Narendra Modi, has taken lots of initiative in strengthening connectivity in the State and the Region adding that the state is set to witness lots of economic activities with good connectivity and completion of vital infrastructure projects. He informed that to supplement the Central Government initiative under the UDAAN project to provide affordable air connectivity for the general public and boost inflow of tourists, the State Government has also launched the CM Air Connectivity Scheme to connect other uncovered ALGs of Arunachal Pradesh like Aalo,Mechuka, Tuting, Walong etc.Further Foundation stone for Airport in State Capital Itanagar will be laid in December 2018 . Responding to a Memorandum submitted by GBs of Mebo , on immediate measures to address the issue of massive erosion by the Siang River threatening the existence of villages and agricultural land due to the turbidity and unusual waves and the resultant siltation of the Siang River since the last two years, Chief Minister assured that required Funds will be sanctioned on priority adding that he has directed the DC to conduct survey with Executing Agency within a day or two and submit DPR at the earliest ,so that flood protection works can completed before the next Monsoon season. The State Government has also been apprised by Local MLA, Lombo Tayeng, on the plight of the farmers and the people due to the erosion by the Siang River and dry spell , on the drought like situation which has hit the farming community. Relief measures to mitigate the farming community will be announced by the State Government shortly after submission of detailed Report for suitable Relief measures by the Chief Secretary. On the longterm measures to combat the erosion caused by Siang River, he said that State Government has been taking it up with the Central Government for adding that Expert Technical team from GoI will soon visit.He also appreciated the suggestion put forward for diversion measures of Siang river from Sigar area put forward by Group Captain Mohanta Panging, VM (Retd). The Government will take all possible steps to address the issue of Erosion and flood, he assured. He also attributed causes of such phenomena of Nature due to Global Warming. The CM said that the Doorstep services “ Sarkar Aapke Dwar” in the villages and other places is to bring the benefits of various Flagships Schemes of the State Government and Government of India to the people and the youth and Government will conduct various outreach activities to reach out to the Youth,rural people and the general public of Arunachal Pradesh. DCM Chowna also addressed on the occasion and sought the cooperation of the people of the area and the state in various developmental efforts. We can take forward the state through the spirit of teamwork, he said. Earlier,the CM also took a meeting with Officers of various departments. Earlier, the dignitaries and other guests were accorded a warm traditional welcome.